Carpal tunnel release surgery is used to relieve severe symptoms of carpal tunnel syndrome, which causes pain or weakness in the hand and forearm. It involves cutting a ligament in the wrist to relieve pressure on a nerve. We will usually only recommend surgery for carpal tunnel syndrome if you have moderate to severe symptoms of the condition. For example, you may have had tingling, numbness and pain in your hand and forearm that has lasted for six months or longer. Carpal tunnel release surgery involves cutting the carpal ligament, which is one of the tissues that connect the bones in your wrist together. This will reduce pressure on the median nerve, which runs through your wrist to your hand. If the operation is successful, your symptoms of pain will often go away immediately after surgery, but symptoms of numbness and tingling may take longer to improve as the nerve recovers more slowly. 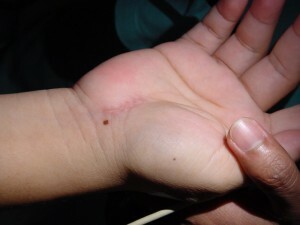 The operation is usually done through a 3–4cm cut on the palm of the hand, near your wrist. 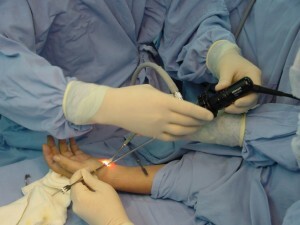 Some surgeons use open surgery (where a single cut is made into your wrist to reach your carpal ligament) and others use a keyhole technique (where small instruments and a tube-like telescopic camera are inserted through small cuts in your wrist). Our surgeon will discuss the technique that he or she recommends. Both open surgery and keyhole surgery are usually done on an out-patient basis, under local anaesthesia, which means you won’t need an overnight stay in hospital. For people with mild symptoms, or symptoms that have been present for a short time, non-surgical treatment is usually recommended. Carpal tunnel syndrome that occurs during the later stages of pregnancy (which is quite common) is also often treated non-surgically. You may be able to try one of the following. Wrists splints. These can help keep your wrist straight and reduce pressure on the median nerve. They are recommended for use at night. Cortisone Injections can help reduce inflammation in your wrist. However, if your condition is severe surgery is usually as a last resort to help relieve your symptoms. Our surgeon will explain how to prepare for your procedure. For example, if you smoke, you will be asked to stop as smoking increases your risk of getting a chest and wound infection, which can slow your recovery. Carpal tunnel release surgery is usually done under local anaesthesia. This means you will be awake during the procedure, but won’t feel any pain in your wrist and palm area. You can eat and drink as usual before having a local anaesthetic. In the operating room, your surgeon will ask you to sit in a chair, or lie down, and rest your arm out to the side. Your surgeon will apply tight compression with a tourniquet to your upper arm. A tourniquet is similar to a cuff or small sleeve that is used to control blood flow to your hand during the operation. Your surgeon will inject a local anaesthetic into your wrist and into the palm of your hand. You may feel a sharp sensation as the anaesthetic is injected, but this passes quickly. The exact procedure will then depend on whether you are having open or keyhole surgery. Both types usually take about 10 to 20 minutes to complete. In open surgery, your surgeon will make a single cut (3–4cm long) near the base of your palm. 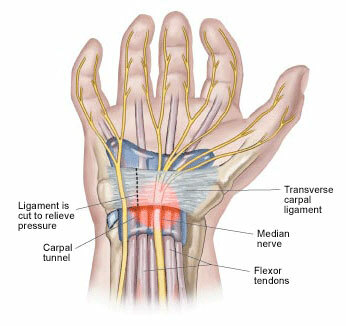 He or she will then cut the carpal ligament to relieve pressure on the median nerve. Your surgeon will close the cut in your skin with stitches. Depending on the technique your surgeon uses, he or she will make either one or two small cuts (about 2cm long) in your skin. The first cut will be on the inside of your wrist and the second (if you have one) will be in the palm of your hand. Your surgeon will insert small instruments and a tube-like telescopic camera through the cut, or cuts. He or she will then cut your carpal ligament, relieving the pressure on the median nerve. Your surgeon will close the cuts in your skin with stitches. After a local anaesthetic, it may take several hours before the feeling comes back into your wrist and hand. Take special care not to bump or knock the area. If you had a sedative, you will need to rest until the effects have passed. You may need pain relief to help with any discomfort as the anaesthetic wears off. Your nurse will usually give you paracetamol or ibuprofen to take. You will usually be able to go home when you feel ready. If you’ve had sedation, you will need to arrange for someone to drive you home. Try to have a friend or relative stay with you for the first 24 hours. The amount of time your stitches will take to disappear depends on the type of stitches you have. However, for these procedures, dissolvable stitches should usually disappear in about seven to 10 days. Non-dissolvable stitches are removed 10 to 14 days after surgery. It usually takes about four weeks to make a full recovery from carpal tunnel release surgery, but this varies between individuals, so it’s important to follow our surgeon’s advice. At night, try to keep your hand elevated on two pillows in your bed for the first two or three nights. Our surgeon may advise you to do some gentle finger-stretching exercises to help reduce stiffness in your hand. This may include straightening and bending your fingers into your palm to make a fist, or gently squeezing a foam ball. You should also try to move your elbow and shoulder regularly to loosen your joints. Call (+65) 6471 2674 (24 hr) for an appointment to see our specialist to discuss open and endoscopic carpal tunnel release surgery today.